Since Mother’s Day is right around the corner, here’s an idea for the moms in your life; give her the gift of some uninterrupted time to soak in the tub… with a glass of wine and a good book. 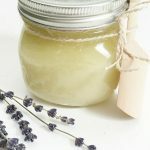 I have a very simple recipe for making your own bath salts. 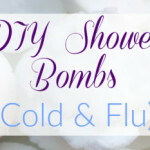 If you are a mom (or not), you can certainly make these for yourself (just sneak in a bath after the kiddos are in bed). *Essential Oil- Not sure where to buy essential oils? Check out this post. Airtight Glass Storage Container- Some essential oils will start to break down plastic, so it is ideal to use a glass container for storage. You also want to keep the salts in an airtight container to avoid moisture. Food Coloring (Optional)- Please note: If you choose to add food coloring to the salts, less is more. Start with just 1 drop and work your way up to the desired color, one drop at a time. If you add too much moisture to the salts, this can cause the salts to harden over time. *Please be aware that some essential oils are not recommended when pregnant, or for use with very young children. Please consult a health professional to address any questions or concerns. 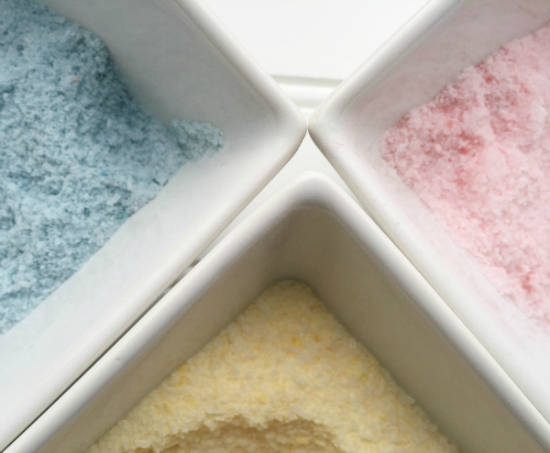 All bath salt recipes start off the same way: Pour 2 cups of Epsom salt into a bowl. You can certainly use more or less depending on the size of your container. 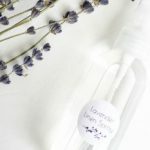 By adding 10-15 drops of Lavender Essential Oil, you create a wonderful relaxing scent. I decided to add a bit of blue and red food coloring to the salts for added color. Keep mixing until evenly distributed. 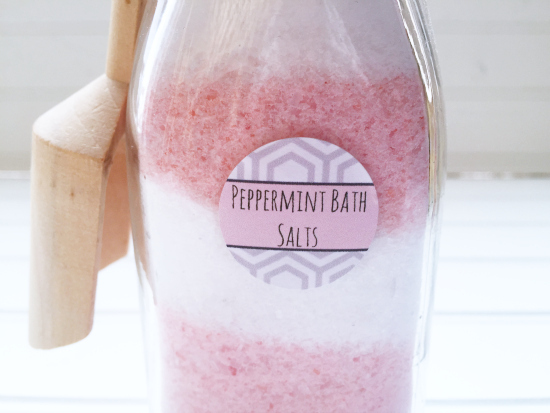 Add 10-15 drops of Peppermint Essential Oil to the Epsom salts to create an energizing scent. This time I decided to get a little fancy and divided the mixture in half prior to adding the color. I then layered in it the container for a striped appearance. The last combination was created for those times when you’re suffering from a cold or flu. I used RC™ , which is a combination oil containing Eucalyptus, Myrtle, Marjoram, Pine, Lavender, Cypress, Black Spruce, and Peppermint. 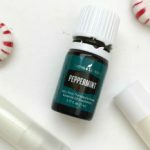 You could also combine 3-5 drops each of Eucalyptus, Lavender, and Peppermint in lieu of the combination oil. I decided to go yellow with this one. You really need a cheery color when you’re not feeling well, right? After you are done mixing everything together, store the salts in an airtight container and add a silica gel pack (optional) to avoid hardening of the salts. Add a label with a little wooden scoop, and you’re good to go. *These printables are formatted for Avery 5410 Labels. (I found them on Amazon, as no office supply stores regularly stocks these labels… plus they are cheaper on Amazon). When you arrive to the “print screen”, uncheck the “Fit to Page” box so they print correctly onto the 4×6 page. 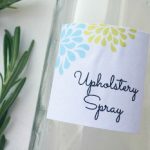 This post was originally published at Clean and Scentsible on January 29, 2016. Hi there! Thanks for the bath salt recipe! 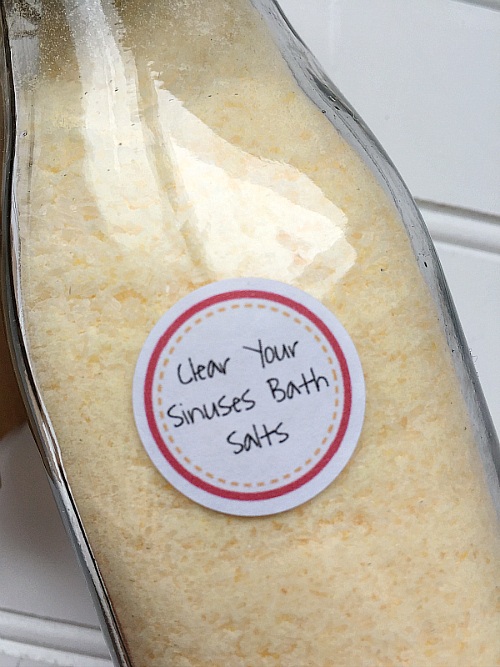 I have made bath salts before but always like checking out new ideas. I had experienced the hardening of the bath salts before. I actually think it might have been the oils and soap colarant I used. I found that spreading out the salts after mixed on some baking sheets to dry overnight before putting in jars really helped. Hopefully that helps your followers if they are still having hardening issues with the salts. Do you ever add Sea Salt? Thanks!! For the silica gels do you open the little bags and mix it with the salt or do u just leave in the little bags and put it on the bottom of the jar? How much of the Bath Salts do you put in your bath ? I add about 1/4 cup. 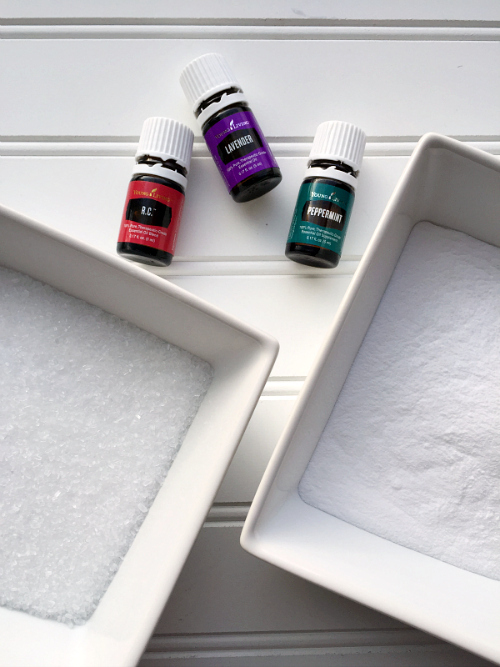 If you add some old fashioned glycerin, you can use baking soda and epsom salt in your mix. It also aids as a moisturizer. I just fell in love with your site! I’m a beginner with essential oils but a real believer. I have some health issues and have found that the oils are often much more helpful than medication. I’ve begun the journey of ridding my home of chemically based cleaning products, not to mention diffusing like crazy. I look forward to your updates and will take them all to heart. Where do you get these container bottles? They are actually Starbucks Frappuccino bottles 🙂 I just cleaned them out, removed the stickers, and spray painted the lids. But you can buy little milk jars like this on Amazon. I’ve also seen them in the Target Hot Spot from time to time. hello, I was wandering if ya can do a print out page with the recipes for each? Where can I find bottles like that? 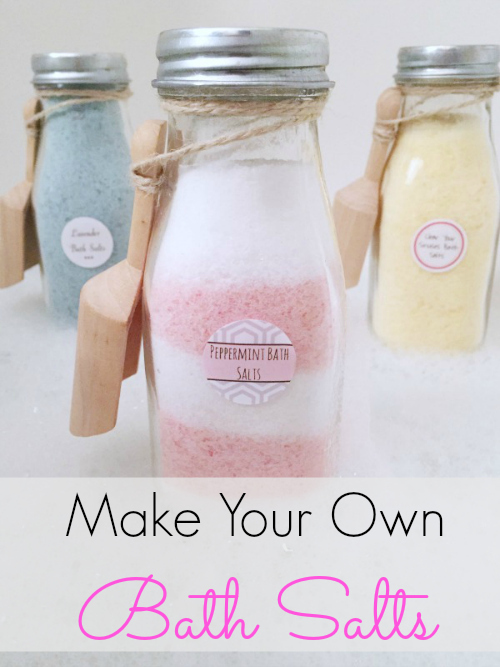 How much of the bath salt mixture do you use each time? I would use about 1/4 cup. Looks fun to do. They make nice gifts. WHERE DID YOU BUY THE OILS? That’s a great question, and I don’t necessarily have the answer. I have made these and used them within a couple months. As long as they don’t get moisture in the bottle to create hardening, they should last a long time. If I were to guess, I’d say a year or two. I think these sound wonderful and I will try! I’d like to address the problem that many are having with the Bath Salts hardening. 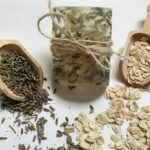 I have been making Bath Salts for many years now and I also had an issue with this initially. The very best way to deal with this is to BAKE your Bath Salt mixture. Spread them out on a foil lined baking sheet (double layer) for 15 minutes @200 degrees F. Stir them every 5 minutes to ensure no burning. Cool and package in an airtight container immediately. Thanks for the tip! 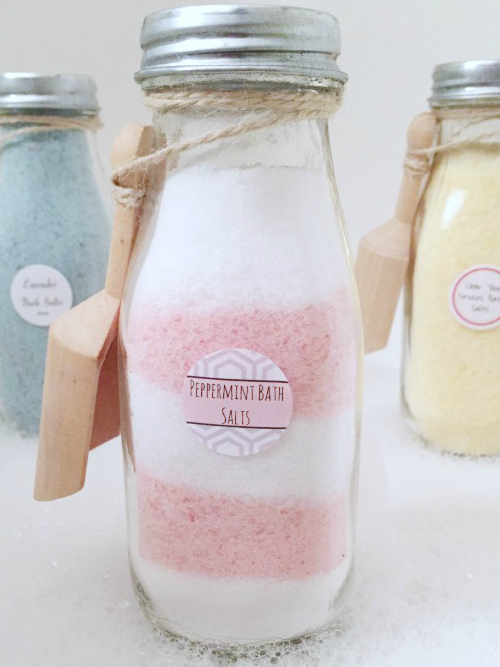 What do you use in your bath salts? Do you use both the Epsom Salt and Baking Soda? I cannot wait to try this! I’m having trouble imagining how one drop of food color covers the Epsom salt completely. What utensil, if any, do you use to mix the coloring and salt? Thank you! Hi and thanks so much for all this info. 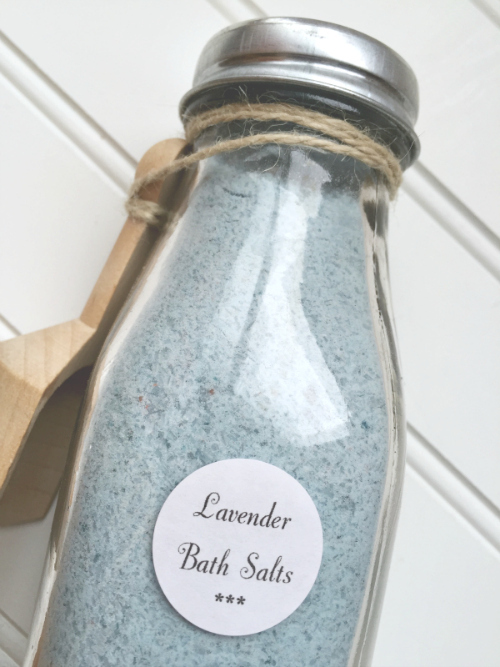 I am making toiletry gift bags for Christmas gifts and just made up some of your bath salts. I used empty dry yogurt containers to mix the salts – just poured everything into the plastic containers, put the lid on and then shook them up well. Love the layering you did with the colours! Also, your comments are useful too. I didn’t know they could clump up. I love the last combination idea! I really like how bath salts can be fragrant and awesome, but sometimes you need something that’s going to directly help you. Having an option to help you clear up congestion is awesome. Honestly, I don’t think it matters. I put mine on top of the salts, but I continued to shake the bottle every couple days to make sure there wasn’t any clumping, so it ended up in the middle. I think it’s up to you as to which way you’d rather do it, but I don’t think the salts will be affected any differently if you place it on top or bottom. Hope that helps. I also made these in a glass container and they hardened all the way through. So all I made was ruined. I am so sorry to hear that this recipes hardened. I originally thought it was the glass jars that might be the culprit because I had stored some of my left over salts in a plastic container and there was no hardening of the salts, even after months of being in the bathroom. I tried doing a bit of research to see if others were experiencing issues with similar recipes, and it turns out the culprit might actually be the baking soda. I am going to try this recipe without the baking soda to make sure that’s the issue (and I’ve updated the post to reflect this). I’m interested in trying these, doesnt the food coloring stain your skin when your soaking in it? every time I’ve used food coloring I always end up with it all over my hands and it takes days to come off. I’m just asking what am I doing wrong that it does that? I have never had a problem with the food coloring staining my skin from use in the bath tub. You would just put a handful or so in the bath with all that water, so it’s pretty diluted. However, when making the salts, you do need to be careful about not getting it on your skin as it really does stain. They now sell food coloring as a gel, so with a thicker texture, maybe it would be easier not to get in on your skin. You can also forego the coloring all together, it’s just there for fun. Wow!! Love it , especially the color of the salt look so nice!!! Where did you buy your bottle from just curious thanks !! Made it 2 times, first with food colouring and essential oils, hard as a rock. Second time with essential oils and rose petals, not sure how yours never got hard. That was after 3 days being in a glass bottle. I am so sorry this happened to you. If you are not using a citrus essential oil, I would try storing it in a plastic container instead, and hopefully this will resolve the issue. I have updated the post so others are aware of this concern as well. No one wants hard bath salts. This is an awesome recipe! Thanks for sharing. Is there a specific kind of food coloring that works better? I have some gel colors from making a birthday cake would that work okay? I feel like all they make is that gel kind now. I tried looking for the “usual liquid kind” and couldn’t find them. I actually used the liquid kind that I had on hand for this recipe, but I would THINK the gel kind would be fine as well, but maybe you’d have to mix a bit more. How much do you add to the bath at a time? Honestly, I just sprinkled some in, but I would guess it was about 1/4 cup or so. Not only interesting and useful to make. But simply loved the adorable bottles!! A must to try! Thanks Amanda. I love the old milk bottles too. You could also put a little bit of rice in a small cloth “bag” that can be found at most craft stores in the jewelry section and toss it into the container. That way you don’t have to worry about “ricing” your bath water. They also make tea bags and coffee bags that you can fill yourself then just iron them shut. They are hard to find though. A good substitute would be a Mr Coffee type filter that you could tape or hot glue shut. Those are good ideas. Thanks for sharing. I also thought of putting a silica packet in there… the ones you’d find in shoe boxes. Hi Erin, I would love to know how to stop this problem I’m having. My bath salts, mixed as above, seem to harden when in the containers. What am I doing wrong? Thanks for you question Cindy. Although I haven’t, personally, experienced clumping with these bath salts, I do have a couple ideas that might help. Typically, the reason the bath salts would clump is due to moisture in the container. First, and foremost, make sure the container is completely dry before you add the mixture to the container, and then, when being stored, make sure the cap is on tightly. My other thought would be to add a layer of rice at the bottom to the container. Rice is often put into salt shakers in restaurants to prevent clumping of the salt (since the holes in the top of the shaker expose it to moisture in the air). If you choose to add rice, I would only use a container wide enough to use a scoop, so you don’t end up mixing the rice in with the bath salts (as would happen if pouring the mixture vs. scooping it out). Then, when you approach the bottom of the container, where the rice becomes visible, toss it. I hope that helps. I thought of one more idea you could try. You know those silica packets you get in different items (the only thing coming to my mind right now it that they’re in shoe boxes)? They are there to absorb moisture as well. Since the silica beads are in a little packet, it wouldn’t interfere with the salts (like rice).